Sea Turtles Nesting Costa Rica – it’s been their beach destination for millions of years! Long before flocks of tourists arrived on the beaches of the Northern Pacific coast of Costa Rica for the annual tourist season, female Olive Ridley Sea Turtles first chose it for their annual nesting season and have been returning for millions of years since. Olive Ridleys nest both individually and in “arribadas”, large nesting aggregations; this is one of the most fascinating characteristics of the Olive Ridley and what makes the sea turtles nesting in Costa Rica season special in San Miguel. While crowds of foreigners arrive en masse at the airports to reach areas like Ostional and bus loads of students are transported from all over the country for overnight trips in the hopes to catch a glimpse of a sea turtles nesting in Costa Rica, the beach at San Miguel quietly welcomes a handful females ashore nightly and local volunteers and neighbors take care to watch over and protect them. A small, rustic house is home to the local preservation station/hatchery and each year in June, volunteers arrive to kick off the annual season of sea turtles nesting in Costa Rica. Every night a small group walks the beach until early morning in search of Olive Ridleys coming ashore. Upon discovering a female they will stay with her, collect her eggs and return them to the hatchery where the eggs are documented and kept safely in the sands away from predators and poachers until a hatchling release is scheduled. The eggs are then exhumed and the new baby hatclings are released back into the ocean to start their journey and the cycle of life over again. Guests at Cristal Azul Hotel have the chance to experience a night patrol and hatchling release first hand, up close and personal. You can even hold the bucket and help release the babies at your feet and then watch them take their first steps toward the surf! Typically, they do not make it out to sea on the first attempt and it takes several bumps and tumbles for them to get caught up in the current to begin their life at sea but that is part of the fun and the experience! Watching one of these little creatures in it’s first few moments of life go up against the Pacific is impressive and a moment not forgotten. Sea turtles nesting Costa Rica – a perfect reason to pack up and head to Cristal Azul Hotel! Families and friends who are planning their summer vacations and want to experience sea turtles nesting in Costa Rica and eco tourism at it’s finest should visit during the first few months of the Green Season for the best weather! Private tours can be arranged with local coordinators who will discuss in detail and show you what it is they do for the sea turtles nesting in Costa Rica and also, for the overall preservation and protection of the local beach and maritime zone of San Miguel. 1. They like to travel! These long-distance travelers have been known to swim up to 4,828 km, Wow! 2. True land and sea creatures they can dive to depths of at least 150 meters (500 feet)! 3. They are quicker than they look! Their smooth shells and paddlelike flippers help them speed through the water as fast as 24 kph. 4. Sea turtles have flourished for uncountable eons, despite being eaten by just about everything under the sun for millions of generations. 5. According to a recent count, volunteers on San Miguel have protected 2618 nests and released 129,529 baby turtles, in the past few years alone. Sea Turtles Nesting Costa Rica Discounted Rate: 20% OFF Nightly Cabina Rate! Lightweight long sleeve shirts, pants and a headlamp with a Red Light. Comfy shoes for walking the beach at night and socks to protect your feet from sand flies. Hot or cold beverage container to carry at night. No cameras at night please but absolutely perfect for day use. 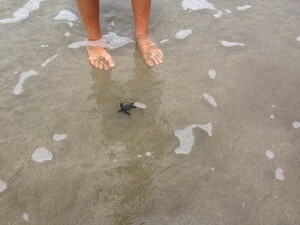 To receive discounted rate please mention Sea Turtles Nesting Costa Rica offer!